Picture this: it’s a weekday night and you’re looking between the clock and your fridge wondering how you’re going to pull off an actual meal. Or it’s a weekend afternoon and you’re feeling exceptionally lazy but you still need to feed yourself. At this point, the takeout menus begin to look extra inviting. 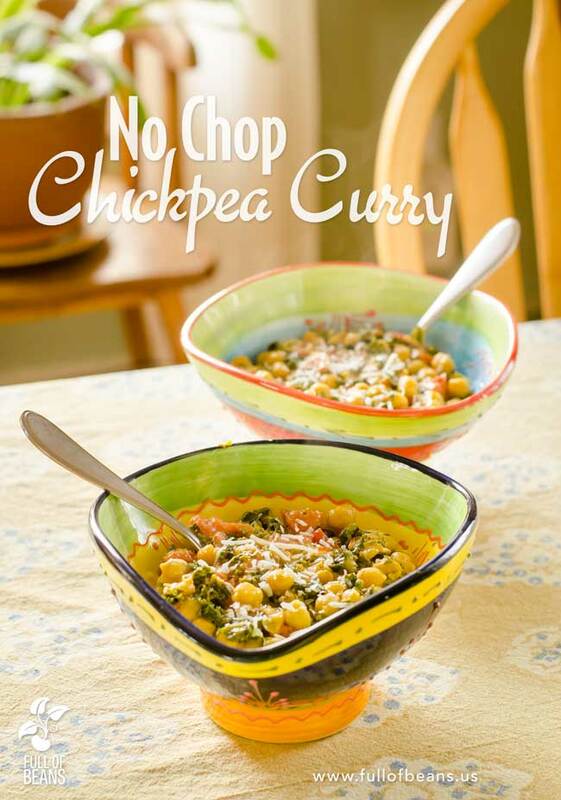 So you have three choices: starve, order takeout, or you can make our No Chop Chickpea Curry. This fast and easy vegan chickpea curry comes together in roughly the amount of time it takes to cook rice (not to mention cheaper and faster than getting take-out). In our house, we love a good curry dish. But, a lot of curry recipes require a significant amount of chopping, cutting, and mincing, and sometimes we don’t have the time or energy for that amount of work. So I was inspired to put together a curry dish that could work for the college students in my life with limited time who are trying to create good vegan meals in dorms, apartments, or kitchens that may also have limited tools. Despite our original inspiration, this No Chop Chickpea Curry can work for anyone who has constraints on their time, is feeling particularly lazy on any given day, or particularly for people who think they can’t cook. I’m serious, this recipe is perfect for new or uncertain cooks who want to expand their repertoire and also not burn the house down. This curry has become a go-to in our house, and not just because it’s quick and easy. If you have guests or are entertaining, this is the perfect distraction-free meal; I love making it when people are over because it frees up my time to enjoy and entertain my guests. 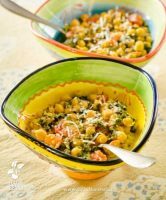 And to top it all off, this No Chop Chickpea Curry is a perfect leftover because it’s an easy and portable meal for work or school that tastes great at room temperature or warmed up. So, start the rice and get going! You will be enjoying dinner in no time – trust us! 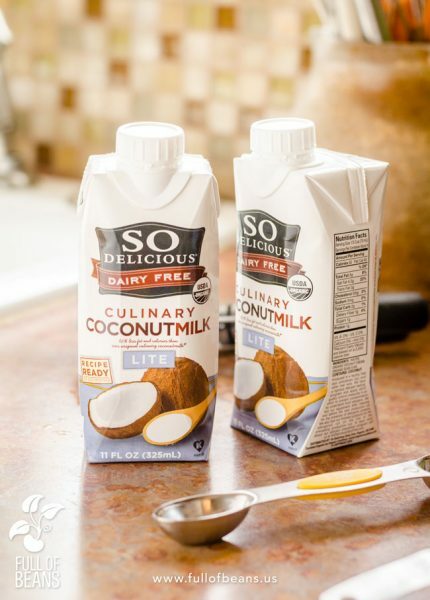 * we like using the low fat culinary coconut milk. it is a huge reduction in the fat and we don’t notice any reduction in flavor. Any good culinary coconut milk will work. 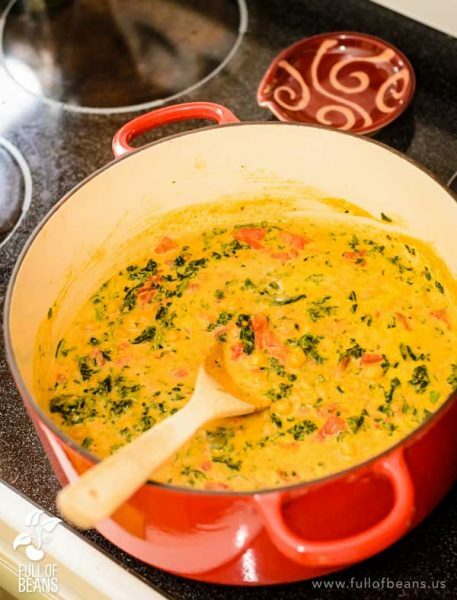 If you just can’t find any, substitute regular coconut milk and add some corn starch to thicken. 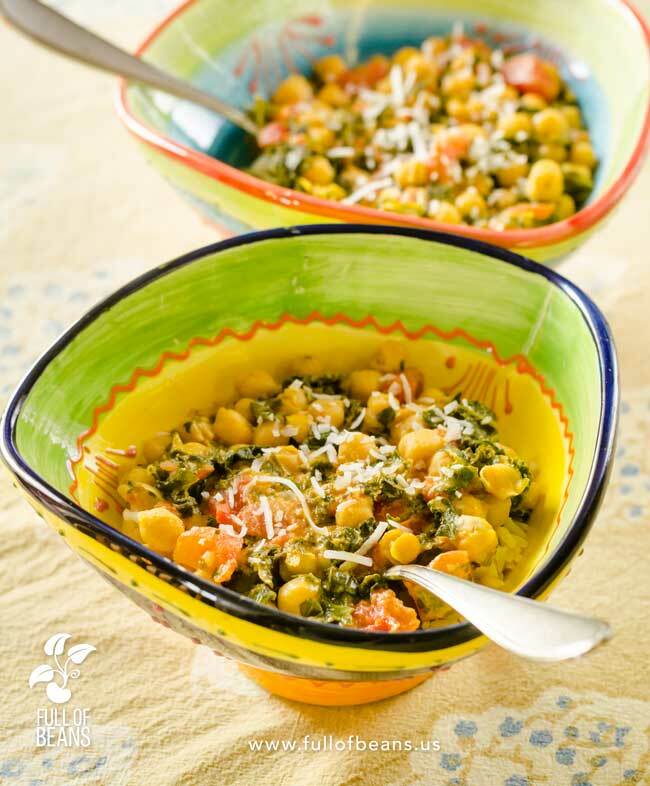 If you only can find the cans of coconut milk, and don’t care for that leftover half can, simply use it all and toss in a little extra chickpeas and spinach. Then adjust the spice to your taste. Great site! Delicious recipe! And i LOVE your name!!! Tastes amazing thanks for the recipe! You’re welcome! Thanks for trying it and letting us know. This sounds good, but I was wondering if we could substitute almond milk for the coconut milk, and maple syrup for the agave (my husband is allergic to agave…makes his face puff up like a toad!) He loves curry, though! No problem with the maple syrup substitution at all. Should be just fine. But the culinary coconut milk adds a slight coconut taste and acts as a thickener. So the almond milk will work, but it will be a bit thinner. Consider a 1:1 substitution of an almond or soy creamer. You can find that at many markets. Or you could add a little corn starch to the almond milk to your desired consistency. Thanks for trying this recipe and being in touch. Please let us know how it works out! This looks so good but was wondering, if I omit the tomatoes, how much liquid should I add to replace the liquid in the tomato can? I have a hard time with night shade vegetables. Oh, we totally understand about the nightshades. Sorry that is an issue for you. you could always give it a try simply leaving the tomatoes out. However, i’ll ask Georgia about some substitution ideas (this is Greg). Asked Georgia about this one. She agrees – just omit the tomatoes. 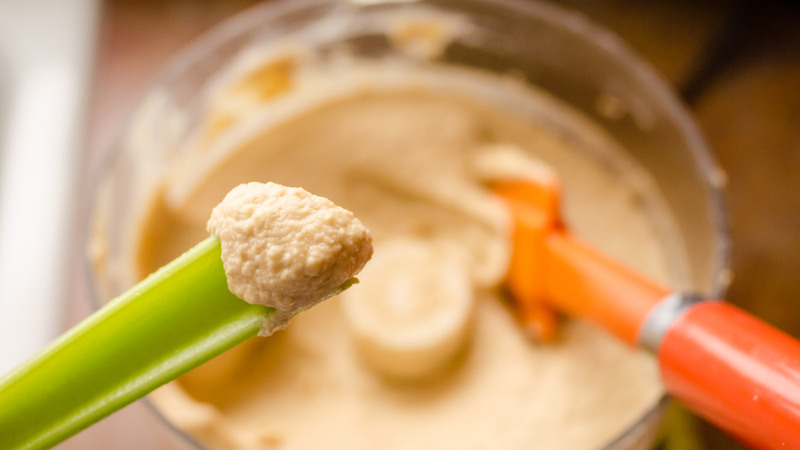 Consider adjusting for thickness, if necessary, by adding some water or a little plant milk (soy, almond, etc). Thank you, I’m trying to steer clear of as many nightshade as I can. I think I’ll add some coconut milk…yumm!! Is the spinach added in frozen or thawed and drained? You can do either. We buy big giant bags of organic frozen spinach from BJs. But you can use what you have on hand. The recipe assumes frozen (and loose, not a block). You can adjust to your taste, too! 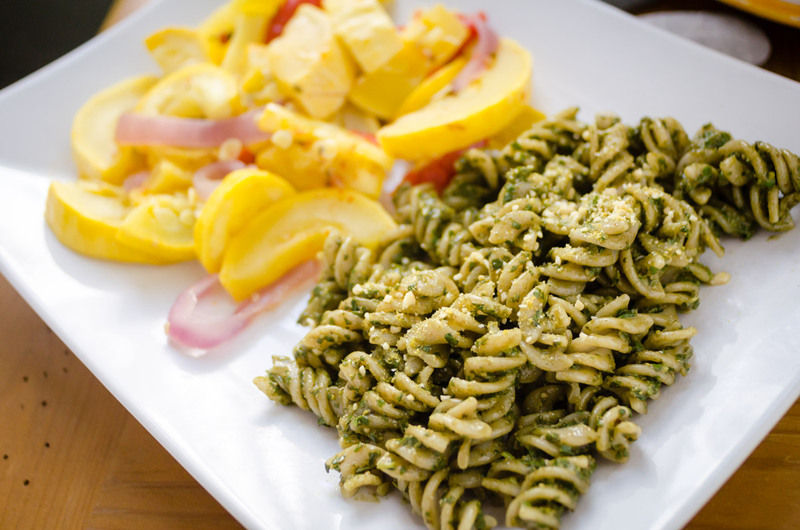 Thanks for trying the recipe – please let us know what you think! Made this for the first time today! Wow! I love it! Will defo be making again. So quick and easy! Thank you. Yay! So glad that you tried it and liked it! “Quick and easy” is exactly what we were after with this recipe. Hi! I gave this a try this week and really liked it. I wasn’t sure how well I liked it on the day I made it – the flavor were fine, just nothing fabulous. But I had leftovers for several meals (my kind of dish) and it definitely was better on day 2 and 3 – I will absolutely make it again. It was quick and easy – I couldn’t quite bring myself to not at least add onions…I get why you didn’t add them – that was the point of “no chop”. We LOVE dishes that keep you (and the family) fed for several meals running – thats part of what we are all about. And the ones that get better with time are our favs (like our Better Than Tuna chickpea salad). If you feel like adding onions, though, go right ahead, we get it.